On April 8, 2013 Credo Reference released the results of a survey they conducted on the information literacy skills of students from more than 400 institutions. Credo also shared these results at a breakfast discussion during the ACRL 2013 conference. We spoke with Laura Miller, a marketing manager/analyst at Credo, to learn more about the findings from their survey. Want more information about the survey results? You can sign-up here to receive the results or visit Credo’s website to view the infographic shown in the video above, along with a video they created on the survey and its key findings. You can also follow Credo on Twitter to hear of other great resources they are sharing related to information literacy. We recently announced that we will be attending ACRL 2013 and wanted to share more exciting news related to the conference. Win a Free SAILS Test Administration! 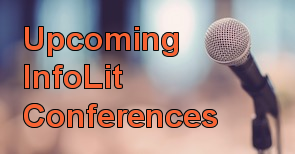 We are looking forward to speaking with academic librarians from across the nation. As an added incentive for visiting our booth, we are giving away one free SAILS test administration to a new client. This prize is valued up to $4,000! Make sure you stop by Booth 1320 to receive your entry instructions. The winner will be selected on May 1, 2013. Another hope for having a booth at ACRL 2013 is that we will be able to connect with our current customers and answer any questions, provide additional ideas for how to apply test results to your institution, and meet you in person. We know you will be busy attending sessions, networking with other academic librarians, and enjoying all the Indianapolis has to offer but we would love to have you stop by our booth, Booth 1320, so we could give you a special “Thank You” gift (one gift per institution that has administered a SAILS test). We don’t want to spoil the surprise, but there just might by a Starbucks gift card included along with a coupon toward your next test administration with Project SAILS! If you will not be attending ACRL 2013, but have a colleague from your institution attending please send them to our booth to collect our “Thank You” gift to you. Schedule a Time to Meet With Our Information Literacy Librarian! We can meet with you individually to talk about your information literacy assessment needs. Let's discuss what it would take to implement SAILS at your school. Our information literacy librarian, Carolyn Radcliff, has extensive experience and knowledge of information literacy assessment options and she is available to meet with you. Just fill out the online form and she will be in touch to set up a time with you. Project SAILS is attending ACRL 2013. Are you? If you are, then you should consider attending one of the many sessions focused on information literacy and assessment. Below is a list of programs that caught my eye as I scoured the conference program. I plan to attend as many of them as possible but will also be busy talking with visitors to our booth. I hope to see you at Booth 1320. Get a jump on the crowds and schedule a time to meet with me. I intended this list to focus on assessment, but I just couldn’t help highlighting other programs that sound amazing and innovative. Click on the program title to see more information on the ACRL conference website. You can also plan the sessions you will attend with ACRL’s easy “My Planner” tool. Megan Oakleaf, Assoc. Professor, Syracuse Univ. Steven Hoover, Senior Asst. Librarian, Syracuse Univ. Jennifer Corbin, Head, Center for Library User Education, Howard-Tilton Memorial Library, Tulane Univ. Michelle Millet, Library Director, John Carroll Univ. Nancy C. DeJoy, Assoc. Professor, Department of Writing, Rhetoric, and American Cultures, Michigan State Univ. Benjamin M. Oberdick, Information Literacy Librarian, Michigan State Univ. Moriana Garcia, Natural Sciences Liaison Librarian, Denison Univ. Deborah Carter Peoples, Science Librarian, Ohio Wesleyan Univ. Project Information Literacy: What Can Be Learned about the Information-Seeking Behavior of Today's College Students? Brooke Gilmore, Information Literacy Librarian, Southern New Hampshire Univ. David Green - Assoc. University Librarian for Collections and Information Services, Northeastern Illinois Univ. Meredith Farkas, Head of Instructional Services, Portland State Univ. Methods Behind the Instructional Madness: Assessing and Enhancing Learning through Portfolios, Mapping and Rubrics. “How is this different from critical thinking?”: The risks and rewards of deepening faculty involvement in an information literacy rubric. Larissa Gordon, Reference Librarian, Arcadia Univ. Scott Rice, Digital Initiatives and Emerging Technologies Librarian, Appalachian State Univ. Building an Instruction Arsenal: Using Standardized Elements to Streamline Class Planning and Ease Student Learning Assessment Across the Curriculum. And, Or, Not . . . three important words for searching success. These three words form the basis of Boolean logic and help students more efficiently search through the complicated world of information and find resources specific to their academic needs. We have heard many instruction librarians discussing the difficulty of keeping students engaged once the “B” word is introduced in a session. Should the “B” word be avoided altogether? Should new methods be used to teach students about Boolean? We think instruction on Boolean should continue to be emphasized when teaching students how to search and locate information. After all, Boolean is included in the ACRL information competency standards and the “searching” portion of the Project SAILS skills sets. But maybe there are better ways to cover this topic. One option is a free tool called Boolify. But the thing we like most about Boolify is that it covers a very important skill set within information literacy in a practical and easy-to-understand manner. The key is that Boolify is focused on the end goal, which is to teach information literacy skills in a way college students can understand and retain. In addition to the free Boolify tool, the site also offers lesson plans for teaching information literacy to your students. Give Boolify a look and consider whether you can use it in your instruction. York University Libraries recently published an article summarizing the collaboration efforts started between faculty and academic librarians in regard to information literacy instruction at their university. These collaborations were deemed necessary and important by the University following the results from a study called Ethnographic Research in Illinois Academic Libraries (ERIAL). The results from the ERIAL project show that “when it comes to finding and evaluating sources in the Internet age, students are downright lousy” and that faculty, students, and academic librarians all bear responsibility. Most importantly, faculty and academic librarians rarely work together for a common goal – to strengthen students’ research skills in order to more effectively complete assignments. The information literacy instruction was taught with a specific application in mind, making the short sessions more impactful than a general IL session. And their IL collaboration efforts are continuing to see great results, as York librarians have created “course-specific library research sessions for an average of 700 classes and assisting approximately 25,000 students” each year. What a great example of academic librarians displaying their value by utilizing the relationship faculty have with students and collaborating with professors to develop course-specific information literacy resources for their students. Another positive is that students are probably far more comfortable approaching academic librarians when they need additional research help for other classes, erasing the myth that academic librarians are only useful when you need help finding a book. Click to read the full article on the York University collaboration. Click to read more about the findings from the ERIAL project.